BOSTON (AP) — On college campuses, white supremacists and other far-right extremist groups see fertile ground to spread their messages and recruit followers. But for many colleges, last weekend's deadly attack at a rally near the University of Virginia exposed a new threat. "People are getting more and more willing to go to the streets," said Sue Riseling, a former police chief at the University of Wisconsin-Madison who is executive director of the International Association of Campus Law Enforcement Administrators. "It seems like what might have been a little in the shadows has come into full sun, and now it's out there and exposed for everyone to see." On the eve of Saturday's rally, young white men wearing khakis and white polo shirts marched through the University of Virginia's campus, holding torches as they chanted racist and anti-Semitic slogans. The next morning, many donned helmets and shields and clashed with counter-protesters before a car drove into the crowd, killing a 32-year-old woman and injuring 19 others. Far-right groups have promised that more rallies will follow. On Monday, Texas A&M University canceled plans for a "White Lives Matter" rally in September. Two days later, the University of Florida denied a request for white nationalist Richard Spencer to rent space on campus for a September event. Spencer and his supporters are promising court challenges. As colleges wonder which campus will be next, Riseling's group is organizing a series of training events in October to help campus police prepare. "If you're sitting on a campus where this hasn't happened, consider this your wake-up call that it might," she said. Last school year, racist flyers popped up on college campuses at a rate that experts called unprecedented. The Anti-Defamation League counted 161 white supremacist "flyering incidents" on 110 college campuses between September and June. Oren Segal, director of the group's Center on Extremism, said the culprits can't be dismissed as harmless trolls. "You might have a few that don't take it seriously. But those that do, those are the ones we're concerned about," Segal said. "A dollar worth of paper, if it triggers the right person, can become $100,000 in media attention," he said. As a student at Towson University in Maryland, Heimbach made headlines for forming a "White Student Union" — a group the school refused to formally recognize — and for scrawling messages like "white pride" in chalk on campus sidewalks. His college years are behind him, but Heimbach still views colleges as promising venues to expand his group's ranks. College students are running four of his group's chapters, he said. "The entire dynamic has changed," Heimbach said. "I used to be the youngest person at white nationalist meetings by 20 or 30 years." The Foundation for the Marketplace of Ideas, a self-described "alt-right" nonprofit educational group, says it's offering legal assistance to students caught hanging up posters or flyers containing "hate facts." The "alt-right" is a fringe movement loosely mixing white nationalism, anti-Semitism and anti-immigration populism. One of the foundation's attorneys, Jason Van Dyke, said he represented a student at Southern Methodist University who was accused last year of posting flyers on campus that said, "Why White Women Shouldn't Date Black Men." The student wasn't suspended or expelled, Van Dyke added. "Just because speech makes someone uncomfortable or offends somebody does not make it a violation of the student code of conduct," he said. Scores of schools publicly denounced the violence in Virginia this week, including some that learned they enroll students who attended the "Unite the Right" rally. The University of Nevada, Reno, said it stands against bigotry and racism but concluded there's "no constitutional or legal reason" to expel Peter Cvjetanovic, a 20-year-old student and school employee who attended the rally, as an online petition demanded. Other schools, including Washington State University, condemned the rally but didn't specifically address their students who attended it. Campus leaders say they walk a fine line when trying to combat messages from hate groups. Many strive to protect speech even if it's offensive but also recognize hate speech can make students feel unsafe. Some schools have sought to counter extremist messages with town halls and events promoting diversity. Others try to avoid drawing attention to hate speech. "This is a transparent effort to bait people into overreacting, thereby giving a minuscule fringe group attention it does not deserve, and that we decline to do," Daniels said in a statement at the time. "My motivation from the beginning was just free speech," he said. Padgett calls himself an "identitarian" — not a white nationalist — and insists "advocating for the interests of white people" doesn't make him a racist. Padgett said he hasn't faced harassment for working with Spencer and doesn't fear any. "There are a lot of people who just sit behind keyboards," he said. "But what are we doing this for if no one wants to show their face?" 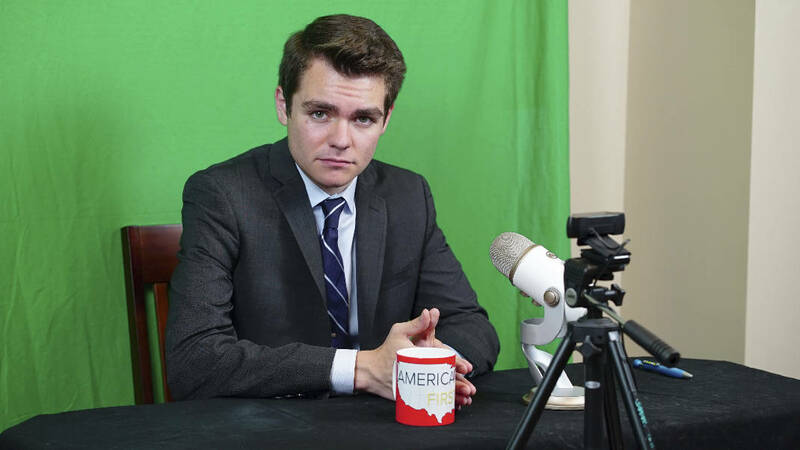 As a freshman at Boston University last year, Nicholas Fuentes looked for other students who shared his far-right views but mostly found political kinship online. The 19-year-old started his own YouTube show and spreads his views through social media. But when he heard about the "Unite the Right" rally in Virginia, he jumped at a chance to network in the real world. "It was going from online to actually physically assembling somewhere," he said. "We shake hands, we look people in the eye. We actually have some solidarity in the movement." Less than an hour after a car plowed into a crowd of counter-protesters, Fuentes posted a defiant Facebook post promising that a "tidal wave of white identity is coming." After receiving online death threats following the rally, Fuentes has withdrawn from Boston University and hopes to head south to Auburn University in Alabama. "I'm ready to return to my base, return to my roots," he said, "to rally the troops and see what I can do down there."